MADISON – Five recipients of the new Regent Scholar awards will be honored by the Research, Economic Development, and Innovation (REDI) Committee at the University of Wisconsin Board of Regents’ February 5 meeting in Madison. The UW System Regent Scholar program was introduced last fall to recognize and reward innovative faculty-student research and to provide support for collaborative UW project initiatives with Wisconsin business and industry. “These grants recognize and honor outside-the-box thinking by UW faculty and undergraduates across Wisconsin. 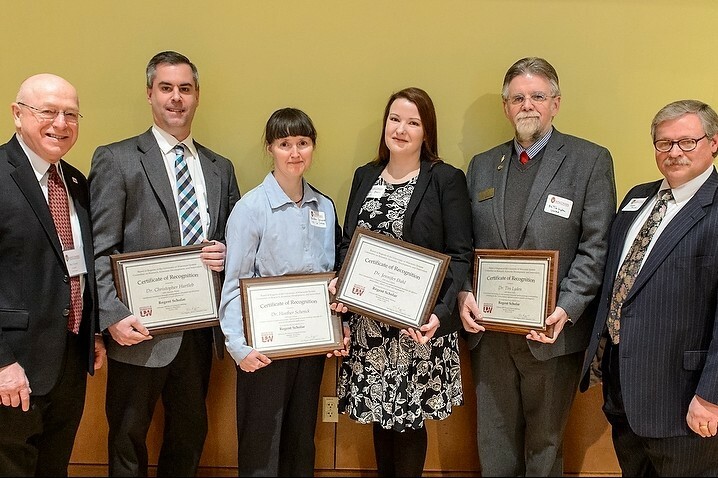 The awards provide recognition at the highest level for work done by our dedicated and talented faculty to prepare a high-quality workforce for the 21st-century economy and ultimately to accelerate business and community development statewide,” said UW System President Ray Cross. Key objectives of the new Regent Scholar program include providing summer funding support for faculty to engage in research and other scholarly activities while stimulating innovation and industry outreach at UW System campuses across a wide spectrum of academic pursuits. Project description: Working with undergraduate researchers, this project will focus on the creation of cross-linked Janus nanoparticle networks that will foster multiple new technologies and applications. These include nanoparticle-based films that increase the efficiency of inexpensive solar-cell materials and the usefulness of integrated optoelectronic circuits, and which also support the development of customized, anti-cancer treatments. Project description: Hydroxamic acids are small chemical structures used in medicine and industry. These materials bind metals and are used for processing of ores and for removing excess iron from blood. They are also used in cancer chemotherapy and contemplated for use in the treatment of viral and bacterial infections. Undergraduate researchers will focus on activities that involve chemical synthesis and nuclear magnetic resonance spectroscopy. Both skills are essential for chemical professionals. Project description: The project focuses on engaging undergraduate students in developing a prototype smart phone-supported sensor for low-cost, real-time monitoring of heavy metal ions in water. The project will also benefit water industries and smart phone makers by enabling additional real-time sensing capabilities with smart phones to increase product performance, market share, and most importantly, to create or retain jobs in Wisconsin. Project description: The project couples scientific insights from 3-D artificial tissue generation research done with undergraduate researchers at the UW-River Falls Tissue and Cellular Innovation Center with an existing technology from industrial partner Microscopy Innovations, LLC of Marshfield, Wis. This technology will facilitate screening and testing of therapeutic approaches to cancerous tumors. The initiative additionally supports biotechnology start-up company Artificial Tissue Systems, LLC, in western Wisconsin. Project description: Aquaponics, or integrated fish and soil-less plant production, represents a transformational global business opportunity for small- and large-scale food production. The goal of the project is to provide research experience for undergraduates while preparing a high-quality workforce for the growing aquaponics industry, focused on food safety, locally grown products, and sustainable harvesting practices. Private-sector partners include Northside Enterprises, which has developed a fast growing, hybrid walleye for Wisconsin’s aquaponics industry, and Nelson and Pade, Inc.®, a national leader in aquaponics. Grants were awarded competitively based on recommendations by a selection committee made up of both public and private sector experts: Kris Andrews, UW System Associate Vice President for Federal and Corporate Relations; Reed Hall, Secretary/CEO of the Wisconsin Economic Development Corporation; Stephen Kolison, UW System Associate Vice President for Academic, Faculty, and Global Programs; Jim Ladwig, Racine County Executive; John Oathout, Executive Vice President and Trust Officer for American National Bank of Beaver Dam; and committee chair Mark Tyler, President/CEO of OEM Fabricators and UW System Regent Emeritus.